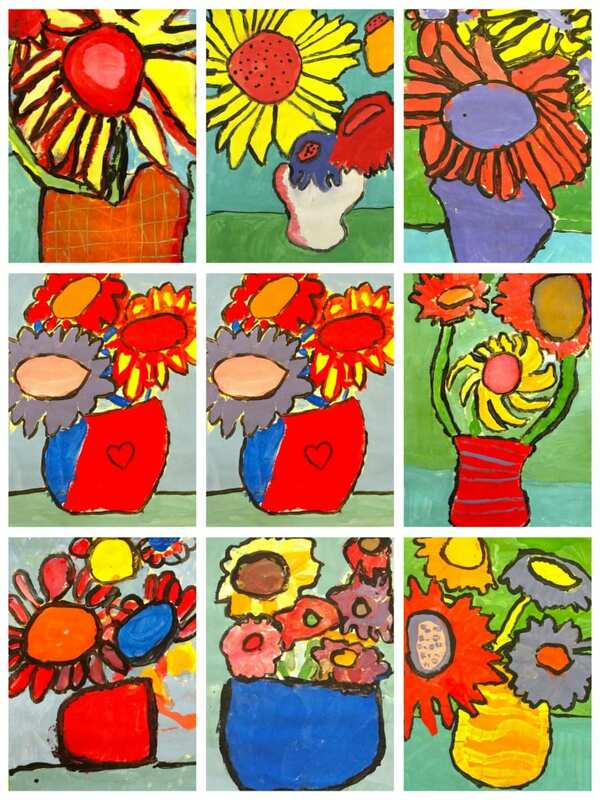 Van Gogh’s famous Sunflower series is one of the most recognizable art subjects in a classroom. My students enjoyed the opportunity to create many types of flowers. Using oil pastel to color is a mess-free choice, although not nearly as “fast” as tempera paints. Try one of these out with your classes. My students loved the flexibility of drawing sunflowers. This lesson took 1 @ 50-minutes. The children start off with an 12″ x 18″ light blue colored paper. If you don’t have lengthy art classes, I suggest you trim the paper to a 10″ x 15″ size. A bit more manageable for artists who need longer to color their work. Draw the vase first (sides and bottoms only) then draw the centers of the flowers. Some centers are round, some are oval, some are little balls. The petals, leaves and stems come next. Last is the table line. Using a variety of oil pastels (I don’t limit them to the colors Van Gogh uses) the kids color away. This takes time and I keep encouraging the kids to color all the blue paper away. This takes some prodding for some kids who want to finish fast, but this lesson really looks wonderful when the kids put in the effort. The last stage (some of my students take a while before reaching this stage) is to add a black line around every petal, leaf, flower center, and vase. Worth it, I think! 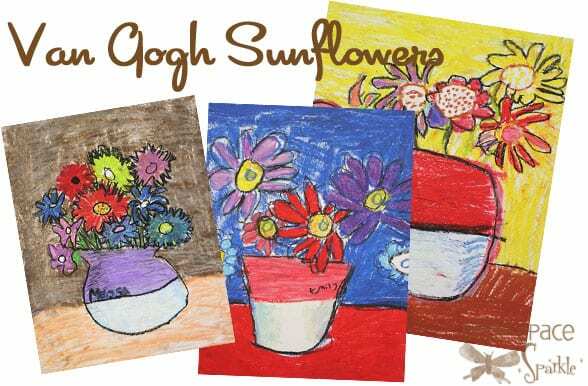 Another perennial favorite…what student can go through elementary school without completing his own version of Van Gogh’s Sunflowers? While I usually do a collection of Sunflowers in oil pastel, I decided to try out a tempera paint version instead. This lesson takes 2 @ 50-minutes. 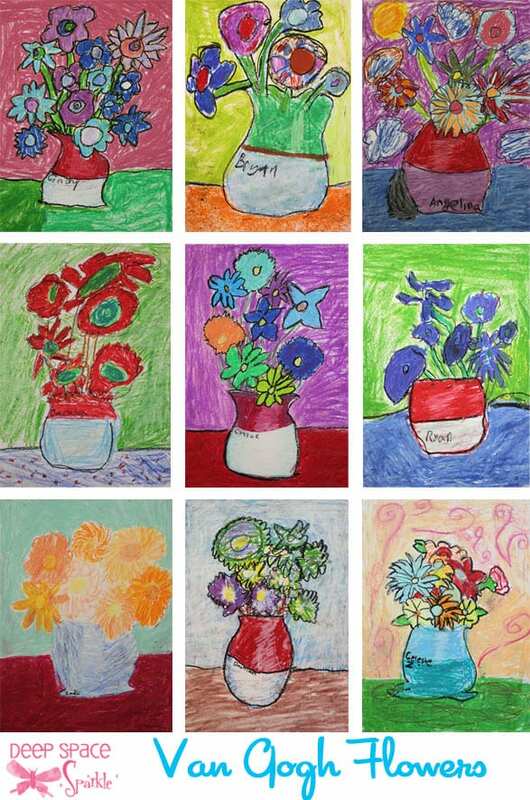 Using an oil pastel, students drew a vase, table line and the flower centers. I demonstrated this step first and gave all sorts of examples to encourage students to create a vase and flowers unique to them. Then, students painted the “tables” in one color and the background in another color. For simplicity, I set out two colors. You may not choose to limit the kids this way, though. This usually marked the end of our first lesson (approx. 45 minutes). For the next step, I set out an assortment of paints and demonstrated how to blend paint using the double-load technique. (Dip paint brush first in one color and then another. Mix directly onto paper). After painting the leaves and petals, children painted their vase and added shadows and highlights. Some children added shadows to the table as well. For a final flourish, the children opted to outline their lines with black or white paint or not at all. I left that decision up to them. This lesson is available in the Van Gogh Bundle inside the Members Club. Scroll down to join the waiting list! Click the yellow button below to get a How to Draw a Daffodil freebie via email. ARE YOU A SPARKLER? Access 0ver 300 art lessons, videos, resources & trainings for one low monthly fee. I was searching for a lesson that used VanGogh’s sunflowers for inporation and stumbled across your blog. I LOVE all of your ideas and projects and was immediately inspired to teach this lesson to my third graders and they loved it. The artwork turned out beautiful and I was impressed with the high level of success. Thank you for this site and for sharing your lessons. Welcome to Deep Space Sparkle. Glad you like the projects. Most of them come from sources off the internet, from art teachers like you. Personally, it helps me to have all my lessons formatted, but I’m glad it’s helpful and inspiring for others. If you have lessons to share…please send a link or give a brief description. We could all use more ideas! Hi! I came across your blog while searching for an art lesson on the net! I think that Van Gogh’s sunflowers would make a great lesson for my kids! We’ll make it tomorrow and I’ll post some of their works in my blog one I find the time. Check out my site at http://handsonarts.blogspot.com most of my posts are art lessons I found in the net though. What lovely results. I can’t wait to try this with my kids. How would this lesson be graded? I really like this lesson, but am quite unfamiliar with teaching and grading art, and I am trying to determine how to set up a grading rubric for this lesson. Any help will be greatly appreciated. I don’t have to grade art, so I’m unfamiliar with a standard rubric. Perhaps other teachers might weigh in. Good luck! My art rubrics usually include use of space, use of colour and creativity. The students would know that the background has to be coloured in and a variety of bright colours would be used. Flowers of different sizes would be part of the evaluation. I love all of your ideas! I stumbled on this one while looking for a lesson on organic shapes to teach my third graders. I can’t wait to get a bouquet of flowers to show students while talking about the different flowers! I absolutely love this lesson. I have shared it with two different second grade classes so far (my son’s and then my daughter’s). The kids are so impressed with the process and the final product. I stick with just the pastels so I can finish in one 50 minute lesson. I do seem to need to let them use pencils first though…otherwise I end up with tears or using up way too much extra paper…I used the light blue construction paper and the colors really shine! Quite a few kids picked this as their favorite project out of the entire year of weekly projects! I also read a book about Van Gogh…it is a story book called “Van Gogh’s Sunflowers” and the kids really get into it. Thanks so much for sharing the lesson. I am totally hooked on this site and on teaching art now!! love it! I’m so happy the lesson worked for you! And its even better that the kids loved their work. Good for you…you must have done a great job teaching. Looking forward to some great art ideas! Great ideas! Looking for something geared more towards 3 and 4 year olds for my preschool class ?